Police officers and rescuers inspect the site of an explosion at a firecracker factory in Tangerang, on the outskirts of Jakarta, Indonesia, Thursday, Oct. 26, 2017. 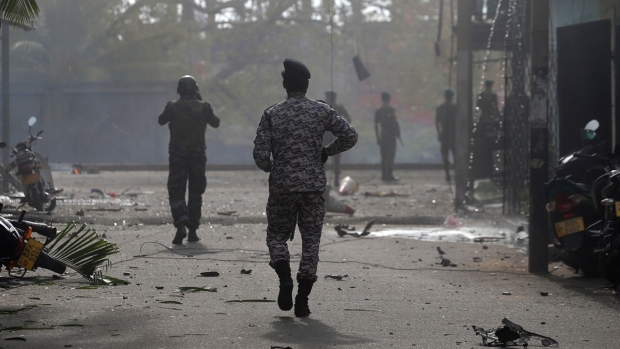 The explosion and raging fire killed a number of people and injured dozens, police said. 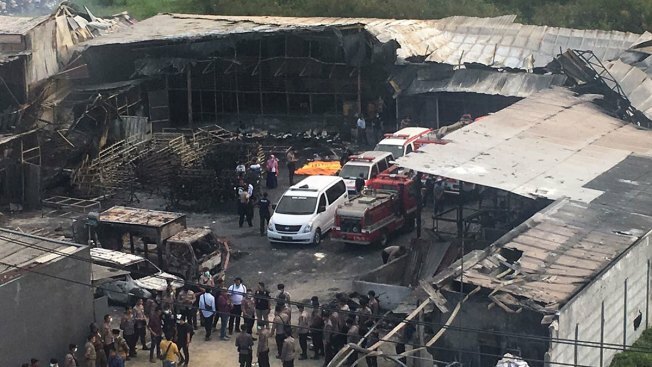 An explosion and inferno at a fireworks factory near the Indonesian capital on Thursday killed at least 47 people, most of them female workers, and injured dozens, police said. Witnesses said a huge explosion was heard from the factory at about 10 a.m. and then smaller blasts echoed across the neighborhood as orange flames jumped from the building and columns of black smoke billowed from it. Hary Kurniawan, chief of police in the Jakarta satellite city of Tangerang, said all the bodies recovered so far were found in the remains of the factory. The death toll could rise as many of those who escaped have suffered extensive burns, said Nico Afinta, general crimes director at Jakarta police. He said bodies were found piled at the rear of the building. "The fire began with a strong explosion like a bomb," Benny, a Tangerang resident who goes by one name, told MetroTV. He said he saw police and residents smash through a factory wall to help workers out. Some of the victims were burning as they ran out, he said. A worker who escaped the fire said the factory's staff, estimated by police be more than 100, was mostly women employed on a casual basis. Mumum, who goes by one name, told Indonesia's TVOne she started working at the factory a few weeks ago and was paid 40,000 rupiah ($3) a day. "I lost so many friends. I couldn't help. Everybody just ran for safety," she said, weeping. The factory is located next to a residential area in Tangerang, a city in Banten province on the western outskirts of Jakarta. A police report said the fire spread after an explosion that caused the roof to collapse. Video showed flames shooting meters above the structure and billowing clouds of black smoke spreading across the neighborhood as residents looked on in horror. Kurniawan said more than 40 injured people were being treated at three hospitals. The factory had been operating for less than two months, he said. "We are still investigating the cause of the fire and questioning witnesses," Kurniawan told reporters. "Factory owners or anyone who neglects and violates safety rules should be held legally responsible." MetroTV, quoting a local official, said although the factory had a permit, its proximity to a residential area was against regulations. Safety laws are inconsistently enforced or even completely ignored in Indonesia, a poor and sprawling archipelago nation where worker rights are often treated as a lower priority than economic growth and jobs.